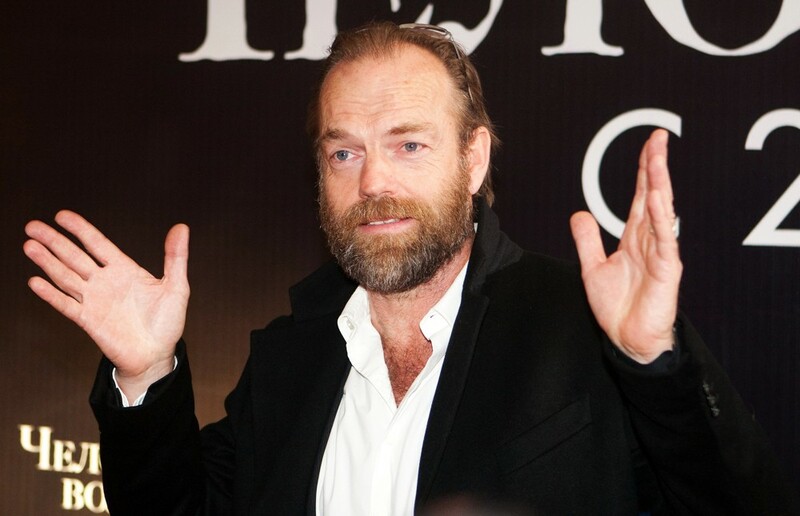 I know nothing about the life of the actor Hugo Weaving, and I even had to look up his name before typing it. He is so famous that he is obscured by his success. He played Agent Smith in the three Matrix films, Elrond in the three Lord of the Rings films, V. in V for Vendetta, and provided the voice for Megatron in the Transformers franchise and Noah in the Happy Feet movies. I trust that the film industry has made him an extraordinarily wealthy man, given that these dozen films have earned approximately $8 billion dollars for that industry. Yet he could walk down my street unnoticed. He disappears into roles that require makeup, prosthetic devices, masks, but always gives portrayals that are compelling, fully realized, quotable—not only quotable because the lines are memorable, quotable because of his delivery of them. Other actors may take on make-up-heavy parts, but, well, Gary Oldman is always Gary Oldman, the best Gary Oldman that there is, but always recognizable as himself. As I wrote above, I know nothing about Weaving’s life and truly hope it is a joy-filled one, but it seems to me that he has the ideal successful life in the arts: He can shine when he wants to and not when demanded, because his face is not his art, even though he is an actor. I once met Stephen King, the rare author who looks like his various portraits on his book jackets, and watched a crowd assemble once someone recognized him and then follow him down Main Street in New Paltz. He was shopping, not doing the things that make him famous, not typing a book while walking, just window shopping. Individuals in the crowd were vying for his attention, perhaps auditioning to be cast by his brain for a part in his next book. In the legend of the Sword of Damocles, Dionysus, a king, offers one of his courtiers, Damocles, that which Damocles covets: total power and extreme wealth. The king suggests they switch places and Damocles accepts. There is one caveat: Dionysus places over the throne a sword that is held in place with a single hair from a horse’s tail. Damocles learns his lesson: Watch what one wishes for. A life of supreme power and wealth comes with the inner neurotic knowledge that the world is vying to take it from you. Damocles happily switches back to his old life. Does a writer want fame and wealth now or long-term but minor admiration later? Myself, I want both most days and do not see these as mutually exclusive. Pulp writers are deserving of study, since they, usually, describe better than many what is happening in his or her culture’s collective imagination. There is a reason so many people buy their books. The writers who are obscure in their lifetimes usually possess something many creative artists do not: a supreme confidence that what they are doing is important to someone, even if that someone is only his or her own self. Readers are nice and all, but are they necessary? Out of the millions of people on this planet, someone might be touched to read these words and learn that they are not alone in feeling or thinking or imagining this or that. It is like believing in true love, and people fall in love every day, right? A single true love reader might be all a writer really needs, whenever love comes to town, humously or post. Every writer is writing to an audience whose size truly can not be known, and it may not matter. If I write a letter to you, I do not know what you are going to do with it. You might toss it away unopened or you might show it to friends. Kafka told his friends to burn all his writings upon his death. Obviously, since we know his name and his works, they (happy for us) betrayed his last wish. If I post a public response to a blog prompt, I do not know if it will be liked (I want it to be considered witty and what-not, but the only say I have in the matter is to write it) or even if it will be read. I want the true love readers and I want to make a living at writing. These are not mutually exclusive. Ah, it’s money that matters. This is first appeared in August 2014.